Happy Friday, friends! Before we dive into the goodness that are these life-changing quesadillas I’d like to take a moment to let out a high-pitched squeal because this weekend is my bachelorette party! Just thinking those words–not even saying or writing them–blows my mind. Me? Bachelorette party? Whaaaaa? My sister will be landing in Chicago shortly and a weekend of girly fun will ensue. I absolutely can’t wait for Saturday night. I’ll be sure to give you all a recap just as soon as I can. Fact: Before last week I had never had a quesadilla in my life. Because I don’t like cheese. And there’s always cheese. But earlier this year, I started making an effort to learn to like cheese for about a million different reasons. Among them: When you don’t eat cheese you realize how many foods contain cheese and I don’t want to miss out on so many foods in life. So basically my queso-phobia was giving me a serious case of FOMO. I’ve been making very small strides (I ate fried brie in Austin! And this meaty baked ziti!) Quesadillas were my next accomplishment. The ‘dilla you see in the first photo? That was Robert’s – ooey and gooey and packed with cheese. That’s probably what you want. The ones above? All mine. Just enough cheese to get a little melty action, but without too much, you know, cheesiness. I’m obsessed. And it’s true–I have been missing out BIG time. I don’t need to explain the million reasons why quesadillas are amazing because you’ve probably had 10,000 more in life than I have. Although my basis for comparison is very small–as in, I’ve only ever had these (twice)–I like to think they’re especially delicious because the chicken and veggies are grilled. That automatically gives you like a million bonus points in the taste department, right? You may have plenty of quesadilla tricks already up your sleeve, but be sure to put these on your menu this summer while you’re still regularly firing up the grill. In a small bowl combine marinade ingredients (olive oil through cumin). Place chicken in a bag or container for marinating. Season with salt and pepper. Add marinade to chicken and let it marinate anywhere from 10 minutes to two hours. Coat rack will cooking spray. Grill peppers and onions until tender and slightly charred, about 5 minutes. Remove from grill and set aside. Once slightly cooled, chop peppers and onions into small pieces. Remove chicken from marinade and grill about 6 minutes on each side until cooked through. Let sit for 5-10 minutes. Thinly slice. Prepare quesadilla: Sprinkle some cheese over half of each tortilla; add some vegetables and chicken; top with some cilantro. Fold tortilla in half over filling. Place 2 quesadillas in pan and cook about 3-5 minutes on each side until cheese melts and tortilla browns. Remove from heat. 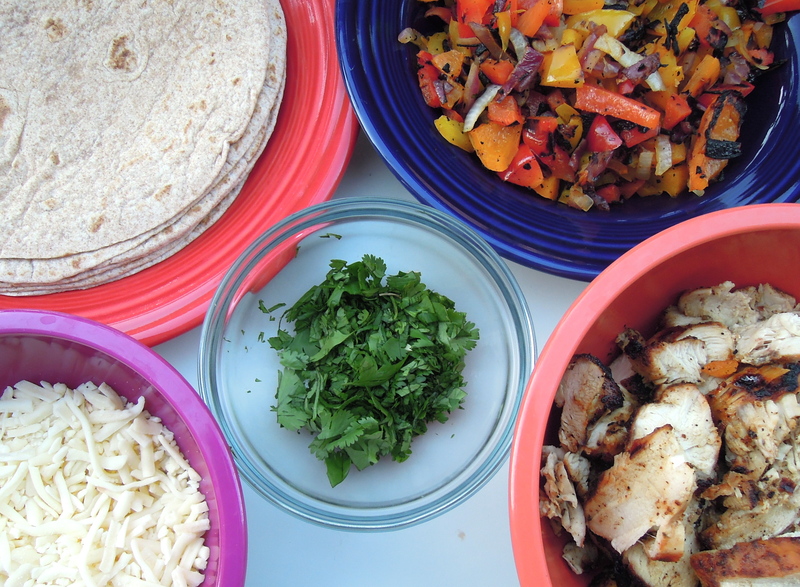 Repeat with remaining tortillas/ingredients. 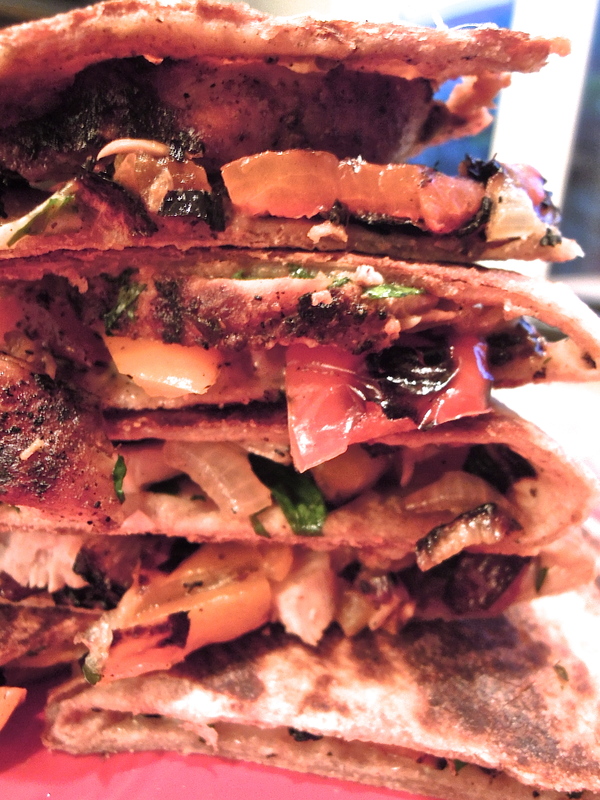 Once quesadillas slightly cool cut into four pieces each. This entry was posted in Chicken, Vegetables on August 16, 2013 by Paige Greenfield.